More and more the customer's wishes are dealt with in a creative manner. Thus nowadays socalled mobile solutions are thought up, so that the customer is helped on the spot and avoids any production or time loss. 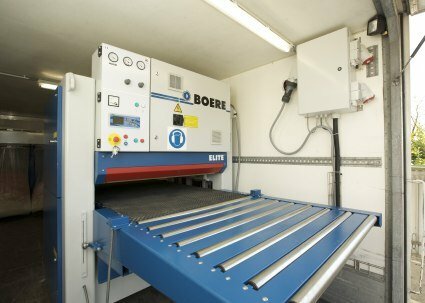 Boere machines can also be delivered in a 'mobile' version and deliverd for the door-to-door renovation of plastic chopping blocks and boards a planing machine which was placed in a van. These chopping blocks or boards are planed, after which they will be fed back to the infeed side of the machine by means of a special return system, since the space in the van is limited. 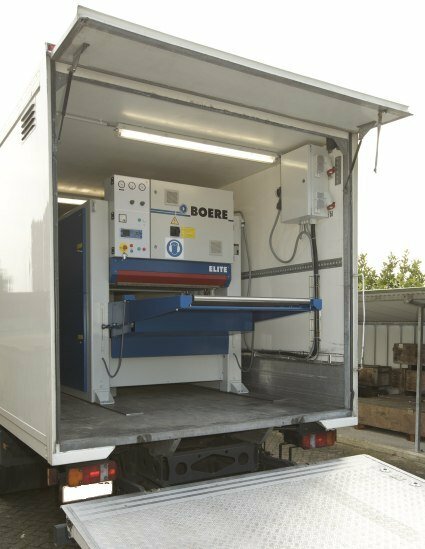 Of course the machine has been built and secured in such a way that it conveniently fits in the van and can function completely independently and safely.